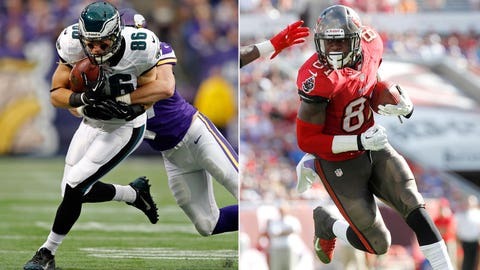 Tight ends Zach Ertz and Tampa Bay's Timothy Wright (right) both collected nine targets and scored one touchdown last week. Here are my top 30 tight ends for Week 16 (standard-scoring leagues). This countdown doesn’t lean on a particular stat. It’s merely an educated best guess of which pass-catchers will tally the best combination of total yards and touchdowns for the NFL’s 16th weekend.